With over 1,000 manufacturing sites in more than 200 countries, Coca-Cola Company knows a thing or two about water. And much of that knowledge is housed in Paul Bowen’s organization. 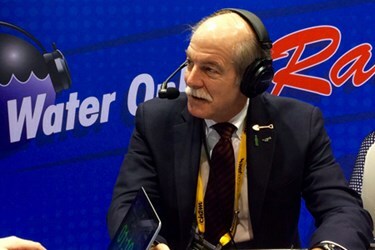 As Director of Sustainable Operations for the Coca-Cola Company and President of the Water Environment Federation’s (WEF) board of trustees, Bowen had plenty to share about the growth of WEFTEC and some of Coca-Cola’s water successes over the past year when he sat down with Water Online Radio at WEFTEC.15. In many ways, the focus of Coca-Cola over the past 20 years to treat water as a valuable resource mirrors the direction and work of the WEF organization over the same timeframe. Water neutral involves the balancing of the amount of water consumed in the manufacturing process with the amount of wastewater treated and then reused in the manufacturing process. Another key area for WEF and for Coca-Cola in the year ahead is stormwater management. To learn more about WEF’s Stormwater Institute and Bowen’s vision for water on a global scale, click on the audio player below.